I was very excited to find this sweet little Bushwhacker or Taghkanic basket. 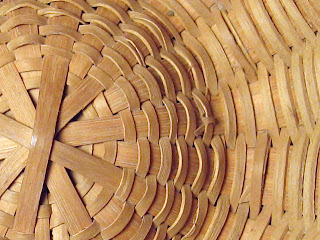 The basket is woven of hand pounded brown ash with rims and handles of ash, oak or hickory. The Bushwhackers used whatever wood was available for rims and handles so it makes it hard to know exactly what wood was used. I can't really see any grain pattern so I doubt they are oak though. Identifying Bushwhacker baskets is actually relatively easy. For one thing they just have a "look" about them. Even from the above photo I was 95% sure it was a Bushwhacker. The hand carved handles have a chunky shoulder and notch and the rims are squatty, but thick. 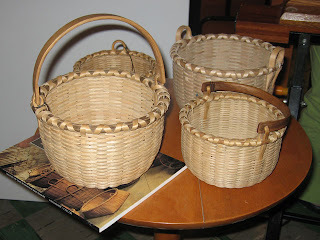 The rims are also double lashed, while many basket makers did this all Bushwhacker baskets will have this. 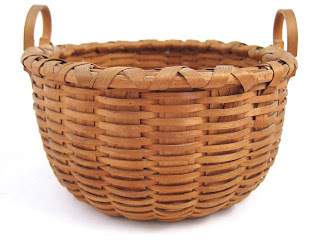 These baskets were often confused with Shaker baskets and in fact this basket was being sold as being possibly Shaker. 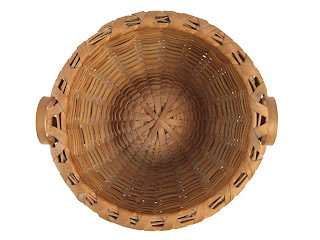 But, unlike most typical Shaker basket which feature a square bottom most typical Bushwhacker baskets feature a round bottom. 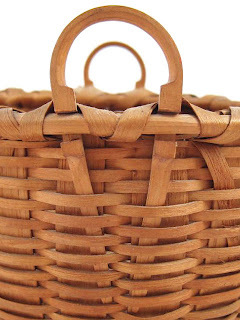 The one feature or signature of a Bushwhacker is the unique "knot" found in the bottom of the basket. 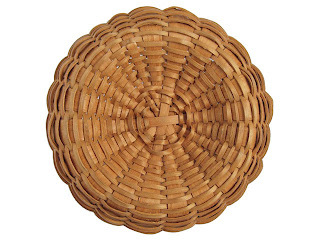 All round bottom Bushwhacker basket will have one of these (unless it has broken off with age). This is the point were the weaver flipped the basket over and began weaving in the opposite direction. Well it only took me 8 months, but I finally have the class photos page up on my website from last summer's Martha Wetherbee workshop. It always seems to take me forever to put these together, but it is always so much fun to look back at the good times we had in the classes. I am putting together the information for next year's classes so watch for that soon too. If you are interest in taking one of these classes be sure to email me.